Your Thanksgiving turkey is just 30 minutes away. Yes! You read that correctly! 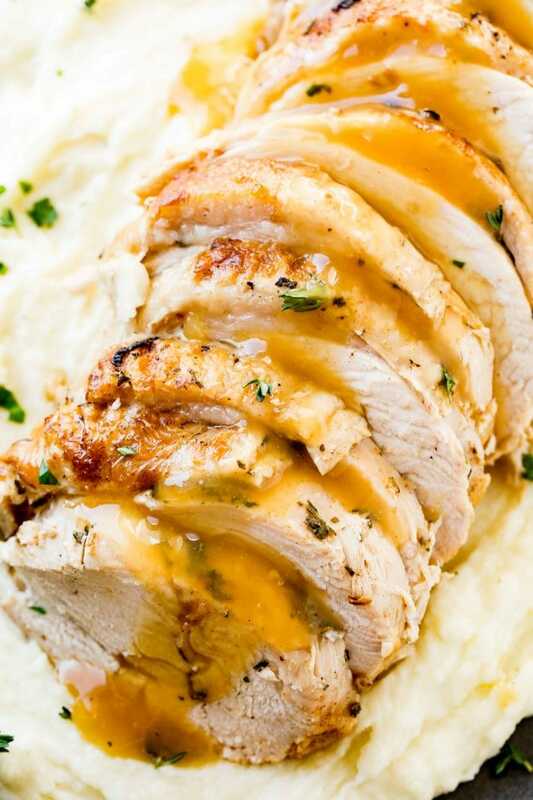 Juicy, perfect Thanksgiving turkey in no time with this Award Winning Instant Pot Turkey Recipe. Our family usually just eats the breast anyway, and we are often doing our own thing on Thanksgiving since everyone is so spread out in our family. So just the turkey breast like this Award Winning Instant Pot Turkey is the perfect size for dinner with enough leftovers for those blessed leftover sandwiches, like The Ultimate Leftover Turkey Bacon Club. You know the ones I’m talking about! We can talk about those later! Plus, and this might be my favorite part, your oven is freed up to make all those delicious Thanksgiving sides. I have many Thanksgiving dinners under my belt and it always becomes a little tricky getting everything done at the same time with everything warm and perfect. Boom! Now your oven isn’t hogged up by the turkey all day! And you don’t have to be on constant turkey alert making sure it’s basted and not overdone or underdone. It’s a win win! Now let’s talk about gravy! Good gracious I love gravy! I’ve mentioned before that I’m a total sauce person so gravy on Thanksgiving is critical! I may or may not put it on just about everything…the turkey, the mashed potatoes, the stuffing, and of course I’m dipping my rolls (yes, plural!) in it! The orange juice makes the best gravy ever. I could drink this stuff! Have I gone too far? You get the point…this gravy is liquid gold! It took us a while to get aboard the Instant Pot train. We wanted to make sure it wasn’t just going to be a fad, and we wanted to test it ourselves on all sorts of different foods. We have tried it on everything from applesauce to yogurt with stops at cheesecake and chili in between. And we are IN LOVE with the Instant Pot. How did we live without it?! This is the Instant Pot we prefer for our family of 5. We totally love it for cooking poultry, and this turkey is no exception! Let’s jump in to this award winning recipe! Make sure your butter is at room temperature and mix it with all the seasonings until it is smooth. Now you’re going to want use about half of the butter and slide it under the skin of the turkey breast without removing the twine. Take the other half of the butter and rub it all over the outside of the skin. Now you are all ready to start cooking. First you want to get a nice golden sear on the outside of the turkey breast. 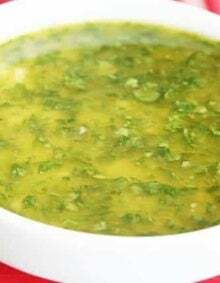 This can be done in a skillet or in the Instant Pot using the “saute” function. Place the turkey skin side down and cook it until it is beautifully golden and repeat this on all sides. Grab your trivet! If your Instant Pot didn’t come with a trivet, this one is our favorite. The trivet is used to keep the turkey breast up out of all the yummy juices that drip off. We will be putting those to good use in the gravy! Stick your trivet in the in the Instant Pot and pour all the butter and juices from the sautéing into the Instant Pot. Here comes the orange juice! Add the orange juice to the Instant Pot and place the turkey on the trivet. Now you let the Instant Pot work its magic. Place the lid on the Instant Pot, ensure the valve is set to seal and cook it on high pressure for 30 minutes. Allow a 10-15 minute natural release, stick bird in a pan and place it under the broiler for a few minutes so it can get all crispy golden again. Then remove the turkey from the oven, tent it with foil, and let it rest for up to 10 minutes while you get groovy with the gravy! Why Does Meat Need to Rest? 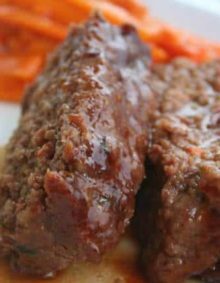 Allowing meat to rest allows all the juices to redistribute and keeps the meat from coming out dry. If you cut meat right away, all the juices come pouring out and your meat isn’t going to be as moist as it could be. Patience…it’s worth it! I don’t know why, but making gravy often intimidates people. You don’t want it lumpy or too thick or too thin, and as I mentioned the gravy is critical!! There is no need for intimidation here! You got this! This gravy separator is pretty much the greatest invention ever! It saves all the yummy drippings while separating out the fat. Add the drippings to a skillet that has been heated to medium heat. Make a quick slurry of water and cornstarch by whisking them together in a small bowl. When the drippings are simmering, add the cornstarch mixture a little at a time until your gravy is the consistency you want. Make sure you are whisking constantly. That will helping you avoid lumps. Then serve that liquid gold all over anything and everything you can! Yes absolutely! As long as the turkey was completely cooked through, you can freeze it and enjoy it on another day! Make sure it is securely wrapped and zipped tight in a Ziplock bag, or better yet, use the Food Saver! Can the Turkey Breast be Cooked from Frozen? Why yes you can! Although I would strongly recommend cooking it from thawed, it can be done from frozen. You won’t be able to get that butter and herbs slathered under the skin, but sometimes you wake up Thanksgiving morning and you realize your turkey is still in the freezer. Don’t panic, friends! Just follow the same directions but up the cook time to 1 hour. No math needed here…yahoo!! It doesn’t matter if your turkey breast is 3 lbs or 6 lbs, the 30 min cook time is going to get the job done perfectly! As promised, we come to quite possibly my favorite part of Thanksgiving dinner….the leftovers!! Is there anything better than a turkey sandwich made with leftover Thanksgiving turkey? 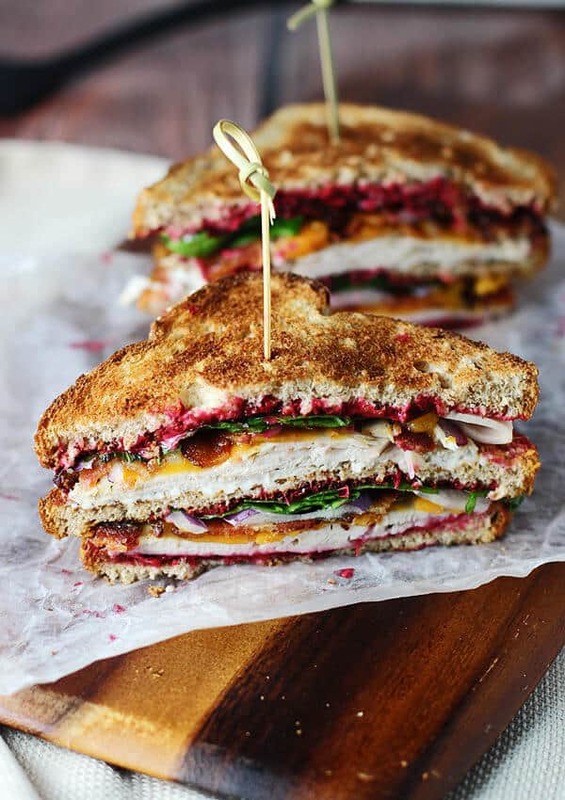 We recommend the Ultimate Leftover Turkey Club! But if you want something quick and simple, we have a friend that swears by turkey jalapeno sandwiches. Grab a leftover roll (and we all pray there are many leftover rolls!! ), cut it in half, put a little mayo on each side, a few pickled jalapenos, and a healthy helping of turkey. I’m totally trying it this year! Check out exactly how to make this Instant Pot Turkey! 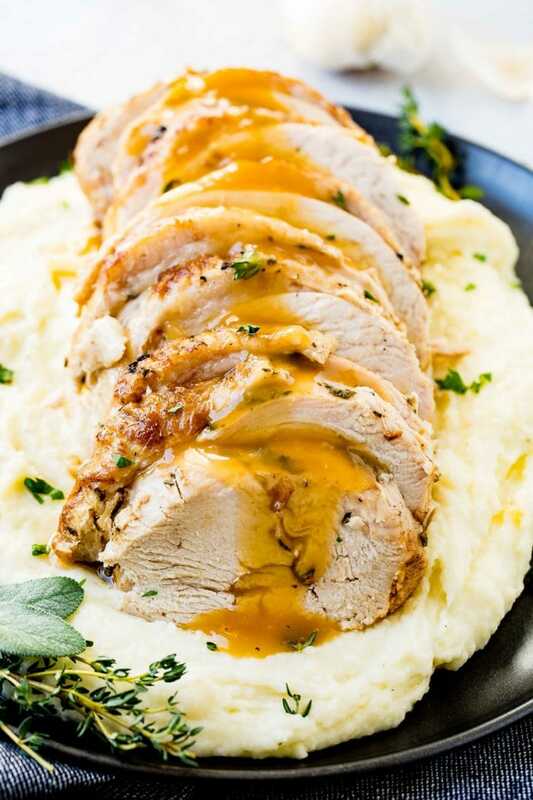 Looking for a few different Thanksgiving recipes to go with this Award Winning Instant Pot Turkey? Here are just a few to get you started: Best Potato Rolls, World’s Best Homemade Rolls, The Real Green Bean Casserole, Heritage Green Bean Casserole with Crispy Shallots, Apple Bacon Cinnamon Stuffing, Twice Baked Sweet Potatoes, Orange Glazed Sweet Potatoes, Texas Roadhouse Loaded Sweet Potato Copycat Recipe, Sweet Potato Casserole, Melting Sweet Potatoes, The Perfect Razzleberry Pie, Homemade Apple Pie, and finally, Classic Pumpkin Pie. In a bowl, combine the butter and seasonings until smooth. Gently, without removing the twine, slide your fingers under the skin and lift the skin up a little. Spread half of the butter mixture under the skin and on the underside of the meat. Spread remaining butter over the skin. Add the turkey, skin side down and cook until golden. Place a trivet in the instant pot and pour the remaining butter and juices from the saute pan into the instant pot. Add the turkey onto the trivet. Place the lid on, making sure the valve is set to seal and cook at high pressure for 30 minutes. 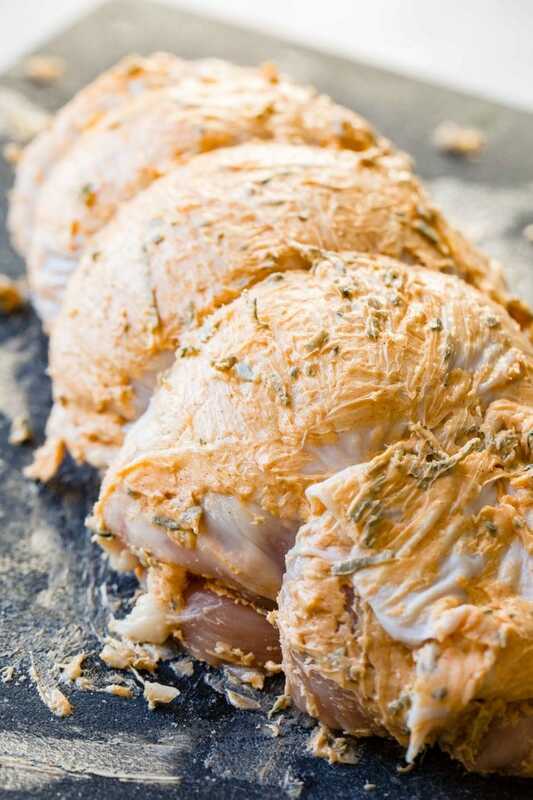 Allow a natural release for 10-15 minutes and then place the breast under the broiler to brown and crisp again. Remove from the oven and tent with foil for up to 10 minutes while you prepare the gravy. Pour the drippings into this gravy separator. Heat a skillet to medium heat and pour in the drippings, stopping at the fat. Whisk together the water and cornstarch. Once the drippings are simmering, add a drizzle of the slurry in (cornstarch mixture) until desired consistency, whisking continuously. 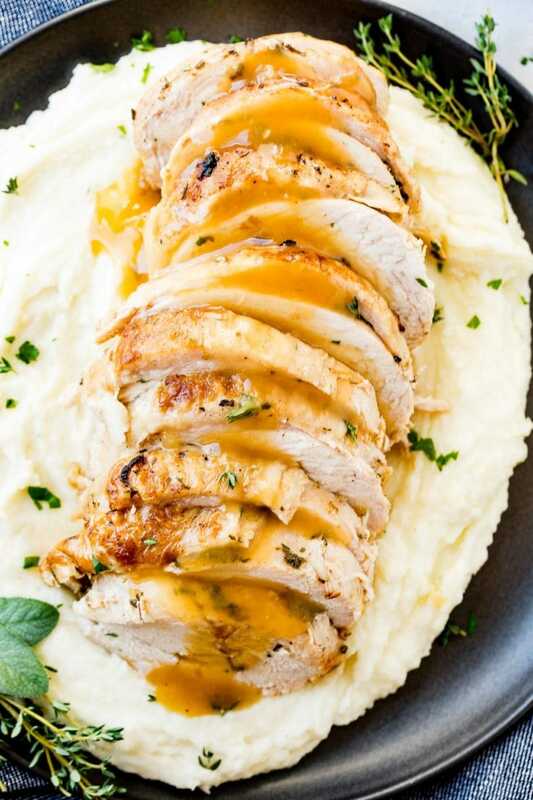 Remove from heat and serve with turkey and these mashed potatoes. We've found that the instant pot doesn't get as hot as a pan, so it goes faster to just use a skillet for the browning. This certainly is a much easier way to make a turkey! Thanks for the recipe! We are obsessed with it! Thanks Kristen! I love how easy this delicious recipe looks… I can’t wait to try it! I use my Instant Pot at least once a wekk. So happy to find a recipe for turkey breast! You’re going to love this Christin!! 1. In my area I bought a fresh turkey breast at Publix (bone in) and asked the meat department to debone it and tie it up. After the bone was taken out my turkey breast was shaped much like the one pictured. 2. Regarding the “Award Winning” title and all the grief the authors are taking I chose this recipe because I cooked their “Award Winnig Chili” recipe and it was great. In fact I entered it in a contest at my church and tied for first place. It is possible they used “Award Winning” in a more generic sense so I am not going to get hung up on the verbiage. 3. The breast I bought was about 3.5 lbs. and had a pop-up timer in it. I found 30 minutes at high pressure only brought this to 140 ° so I had to re-pressure the pot twice for 5 minutes at a time to get it done. I will adjust the time to be somewhere between 35-40 minutes the next time I cook it. Even with all the stop and starts at the end the turkey came out pretty darn good. I look forward for it to be even better the next time. Thank you Lee! I appreciate all you feedback and you support! I’m glad you enjoyed it even it took a little longer to get there! Do you use orange juice from concentrate? Or fresh squeezed? You can use whichever one you want. Whatever taste you prefer! Made it tonight for dinner and it was awesome! Help! I don’t have a gravy separator and I wanted to make this today. Any suggestions? Also does turkey have to be frozen or thawed when going in the instapot? Just got mine and I can’t wait to use it 🙂 happy thanksgiving!! The breast looks so much like the “Jenny-O” brand of turkey tenderloin we have here in Georgia Krogers! I wonder if I could just use a couple of turkey tenderloins and tie it so it would stay pretty? Have you tried putting stuffing in the breast and then having it tied? One of your pics inspired me since it looked like it was stuffed in the middle with something yum! We haven’t tried just doing a tenderloin or stuffing it. If you try it, we would love to hear how it goes!! Hi! If you want to double the recipe and cook two breasts, does that change the cook time? Hi Tanya! Two breasts won’t fit height wise in our Instant Pot, so we’ve never been able to test that. I think you have convinced me that I need an Instant Pot! 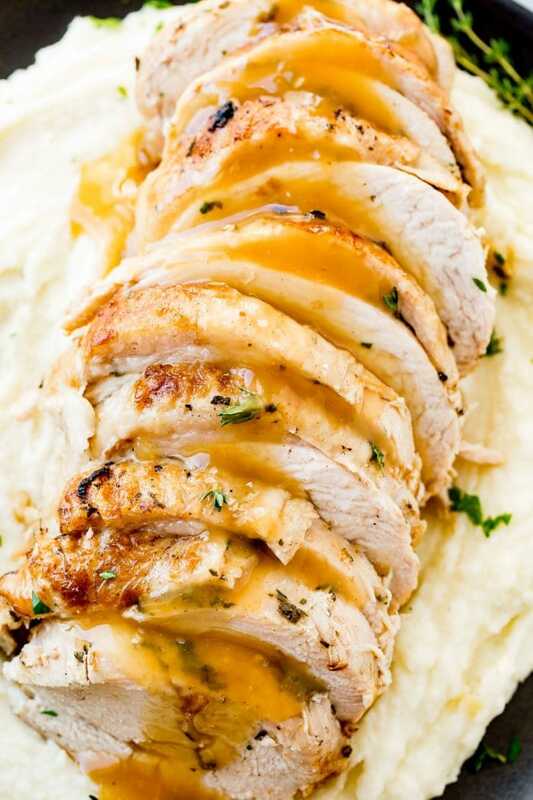 This turkey looks over the top amazing and you are right about the importance of the gravy!! We are all in on the Instant Pot! Everyone should have one!! You’ll have to let me know if you get one and the first recipe you cook in it! Might consider this recipe, but others have asked questions that the author hasn’t bothered to answer so I’ll keep looking. 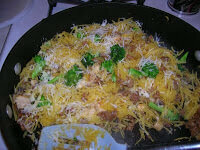 Nothing in the blog states that this recipe won any awards and the author isn’t owning up. Think I’ll look for something else. I agree. It’s sketchy to name it “award winning”. I just got an Instant Pot and have only used it once so far. I’m so excited to try this recipe! Enjoy!! We would love to hear what you think! Jumping on the “What brand of bone in turkey breast is wrapped in twine?” bandwagon. I’ve made my turkey breast in my large slow cooker the last several years and it turns out nearly perfect, but I have recipes to make in the crockpot this year and would love to use my Instant Pot. Okay, on rereading this, I’m a dope. It says boneless, not bone in. Might have to give this a try. Deboning my turkey breast is a chore I don’t want to have to do this year since I work on Thanksgiving. I’m so sorry I missed this somehow! Yes, boneless! I bought it at a local grocery store here called Meiers. The butcher wrapped it up for me. What award did it win?! This looks SO good. I don’t even like turkey that much and this looks good. The only problem is that I don’t have an insta pot. Is there a way I can make it without one? Yes, you can roast it just like any other turkey breast. 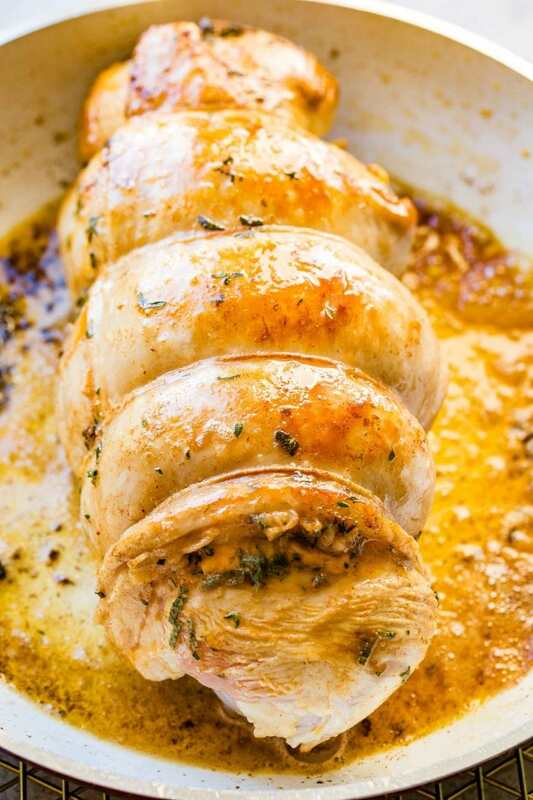 Check out our Herb Roasted Turkey recipe for how to cook it! We LOVE our Instant Pot! I bought this one a local grocery store here and that’s how the butcher wrapped it. We find it contains everything better when it’s wrapped like that. If you can’t find one pre-wrapped, you can always tie a few strands of cooking twine around it. Turkey breast looks awesome! I have 1 question did you use a boneless breast or bone in 1 more question how much did it weigh? Thanks . It is a boneless turkey breast, and ours was about 3 lbs. Is that a bone-in or boneless breast? I’ve never seen one that cylindrical shape. Thanks. Boneless! I bought it at a local grocery store here. They butchered it for me.